To Local Companies on Annual Renewable Contracts as a Primespot® Agent. 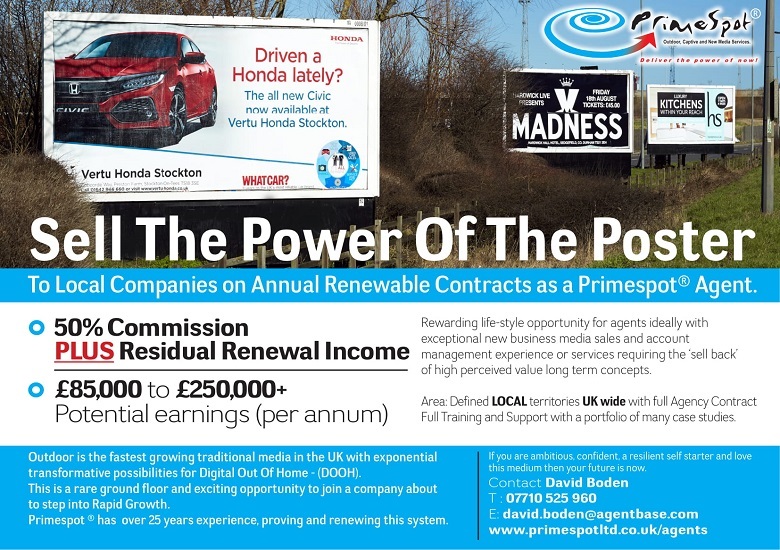 Rewarding life-style opportunity for agents ideally with exceptional new business media sales and account management experience or services requiring the ‘sell back’ of high perceived value long term concepts. Full Training and Support with a portfolio of many case studies. Outdoor is the fastest growing traditional media in the UK with exponential transformative possibilities for Digital Out Of Home – (DOOH). This is a rare ground floor and exciting opportunity to join a company about to step into Rapid Growth. Primespot ® has over 25 years experience, proving and renewing this system.